THURSDAY, Aug. 17, 2017 (HealthDay News) -- Salads are a diet staple for good reason -- they're low calorie and filling. But they can also become boring, and if you need high-fat dressings to jazz them up, you defeat their purpose. Here are four ways to rethink your salad. Start by experimenting with new leafy green varieties like spicy watercress and arugula or nutrient-rich kale and collard greens, according to ChooseMyPlate.gov from the U.S. Department of Agriculture. Spinach also makes a great salad base and a tasty alternative to lettuce. Look for salad mixes at the supermarket or toss together your own combinations. When building your salad, go beyond typical tomato-and-cucumber. Cup for cup, cooked or raw vegetables have fewer calories and add taste as well as nutrients. Try veggies from asparagus to zucchini -- artichoke hearts, Brussels sprouts, broccoli, cauliflower, string beans, peas and peppers, to name a few. Also, excite your taste buds by trying different textures -- grate or dice vegetables rather than just slicing them. You can easily turn a side salad into a meal by adding half a cup of beans -- you'll get fiber, some protein and great taste. For even more protein, try boiled shrimp, diced chicken, hard-boiled eggs (especially the low-calorie whites) or tuna flakes. 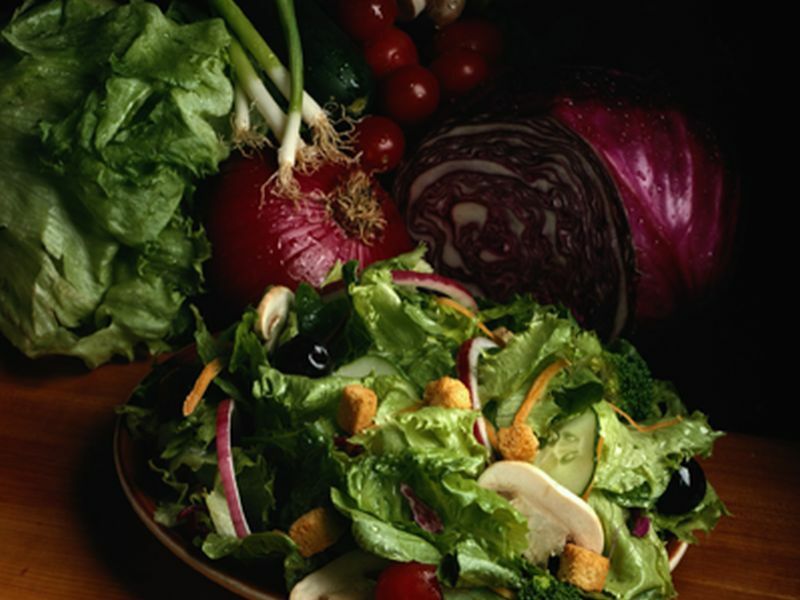 When you add a wide variety of healthy foods to your salad, you won't have to drown it in dressing to enjoy it. Still want more pizzazz? For added zest, try fresh or dried herbs, flavored vinegars or even a squeeze of lemon.